Not one to sit still, the GapFiller project has been bringing colour and life back into dull and dreary spaces opened up by the Christchurch earthquakes. From painted pianos and artworks, to their innovative Dance-o-Mat, they have turned their brushes, Resene paint and energy to a whole host of projects. The Dance-o-Mat, open over the warmer months for a whole host of dance events, was certainly one of their most memorable activities providing a superb dance floor for people to dance the night away in the open air. Complete with coin operated lighting and sound courtesy of a converted washing machine, dancers could bring along their MP3 player/ipod/phone loaded with their own music and start busting their moves. Another of GapFiller's colourful projects is Knit Happens by Jen McBride, recreating the handcraft of knitting in paint colour. 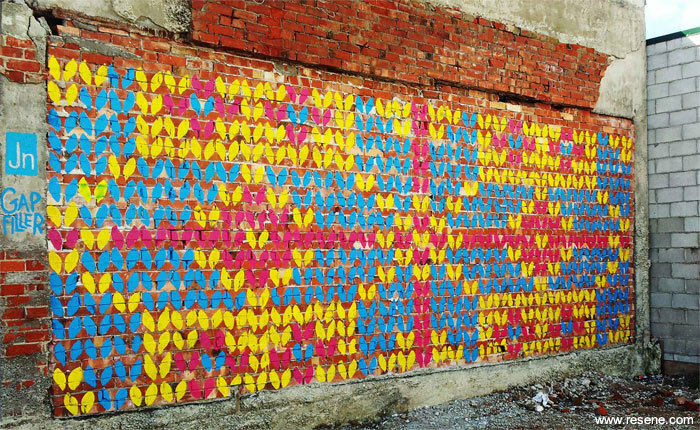 Blank central city wall comes to life on National Poetry Day! 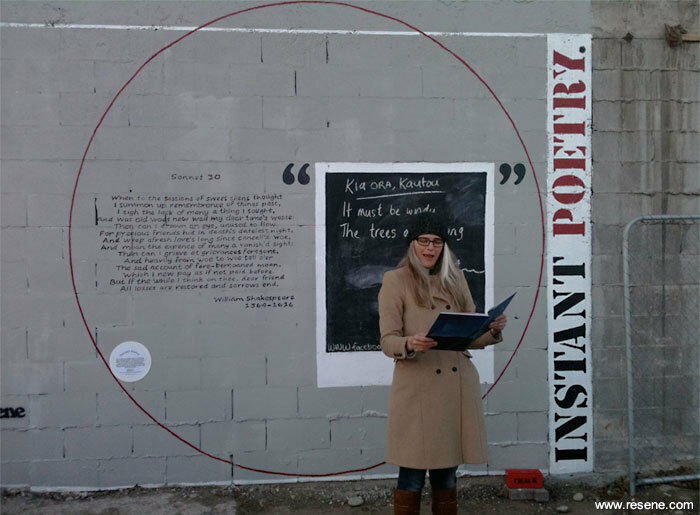 Urban poetry project, POETICA has produced an interactive poetry installation on the wall of 614 Colombo Street (former Begg’s Music store) for its first poetry project, The Instant Poetry Wall. The purpose of the project was to visualise the regeneration of Christchurch as an unwritten poem and the launch coincided with National Poetry Day. The Poetica site offers a blackboard space to write in chalk (and in the language of your choice) your own instant poem or post an existing poem that has inspired you. Poets could take a picture of their work and post it on the Poetica Facebook page: https://www.facebook.com/Poetica.christchurch. 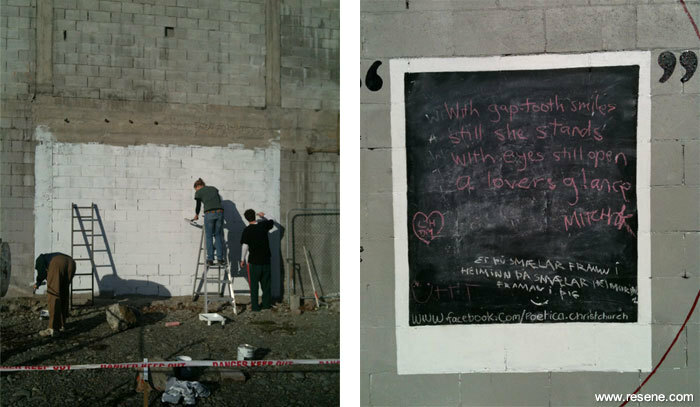 The poem that was “liked” most was painted permanently on the “Instant Poetry” wall at 614 Colombo Street. Gap Filler aims to temporarily activate vacant sites within Christchurch with creative projects for community benefit, to make for a more interesting, dynamic and vibrant city. You can volunteer, make a donation and offer other support on their website.